In 2010, I taught a class at Facets Film School on the films of Carole Lombard. The class was entitled Carole Lombard: The Divine Screwball. In that class was Chicago Magazine writer and dining editor Penny Pollack. After the class was over, Penny decided to write about her experience. It’s a fun look at how classes at Facets work. A new film club begins February 12, 2013: High Heels and Fedoras, Exploring Film Noir at “The Venue 1550” at the Daystar Center, 1550 S. State St., Chicago. Check out last season’s series and what the local press had to say. News of this event was picked up by the Chicago Journal. 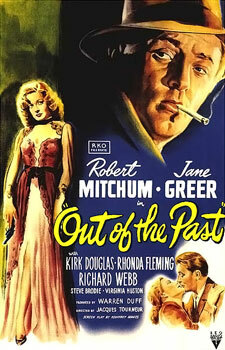 Out of the Past (right) is considered one of the greatest (if not the best) film noir of all time. It made Robert Mitchum a star and gave a boost to the emerging film careers of Kirk Douglas and Rhonda Flemming who would go on to costar together in Gunfight at O.K. Corral.